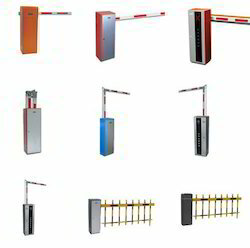 We are a leading Service Provider of flap barrier, compact swing barrier, tripod turnstile and barrier gate from Pune, India. Flap Barrier consists of cabinet, reader module, main control module, motor driver module, infrared photocell, alarm device, limit switch and voice prompt device etc., can be used for the applications like Airports, factory, museum, metro station etc. Together with intelligent card reader/writer and management software, they are combined as intelligent flap barrier management system, can fulfill the functions like entrance control, time attendance, pedestrian volume control and tolling etc. Smartcard reader compatible with a variety of card such as HID and RFID card. Can be expanded to automatic identification system, realizing function of access control, pedestrian flow control,attendance check or fare collection. LED gate direction indicator that displays the current operational state to pedestrian. Green arrow for entry free, Red cross for passage locked. Compact swing barrier is designed to allow passage of wheel chair, pushing prams or passage with luggage, mainly used in mall, commercial complex, IT Towers etc. Use SS304 stainless steel for the whole case, and adopt anti-damp, dust-proofing, water-proofing international standard design. Based on standardization design, use laser cropping and cutting, instant-formation Technology, mechanized wire drawing technology, modularized docking,convenient for work piece loading and unloading and also for maintenance, a high level of parts exchanging. Use 2mm stainless steel for the whole case, durable and reliable, free distortion. The panel of the barrier uses high-intensity material, logo on the panel can be customized. Stand alone infrared photocell can be applied. International electrical interface, can be connected to the 3rd party read/write device, including: IC/EM reader, Bar-code paper ticket system, fingerprint reader, 3D face recognition device etc. The flaps will open automatically during power interruption. The operation speed of the panel can be adjusted on the control board according to the circumstance and passing speed. 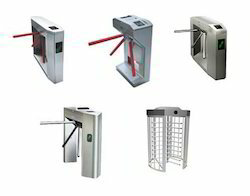 Semi-automatic tripod turnstile consists of reader module, main controller module, direction guide, limit switch etc., can be used for entrance control, applications like apartment, factory, museum, metro station and IT towers etc. 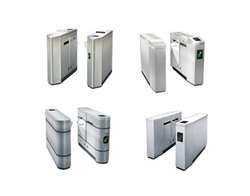 Together with intelligent card reader/writer and management software, they are combined as intelligent tripod turnstile management system, can fulfill the functions like entrance control, time attendance, pedestrian volume control and tolling etc. 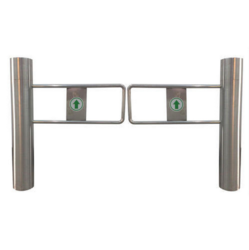 The equipment opens half-automatically; Mifare-1, IC, ID and Bluetooth are available to be used with the tripod turnstile. Automatic Boom Barrier Gate is equipped with red/green changeable indicating led, green prompt passing allowed, and red prompt passing prohibited, which will make vehicle passing smooth and safe under the humanized design. Red / Green changeable traffic light. "Gate open" command has high priority. Three operation modes: Remote control push button manually operation. Loop detector can be equipped. Looking for “Entrance Automation System”?